Barnes & Noble Sued Over Nook E-Reader | OhGizmo! Remember last month how we told you about the Alex Dual Screen eBook Reader? I wouldn’t be all that surprised if it doesn’t stick out in your mind, as it was easily overshadowed by the Nook from Barns & Noble. Well the two had one very distinct feature in common, namely their extra color LCD screen. It seemed a little coincidental that two readers would come out so close together with this feature. Apparently Spring Design thinks it’s not so much of a coincidence. Spring Design filed suit this week against Barnes & Noble, accusing them of misappropriateing trade secrets and violating a non-disclosure agreement. Apparently Spring Design had shown off their device in hopes to work with the bookstore giant. Sure, it’s possible that both companies just happened to have the same great idea, but not very likely. Barnes & Noble have not yet responded to these claims, but it will be interesting to hear their side of the story. Patents are touchy. They should have known they were infringing. That's a shame. People should work together in times like this. Not steal great ideas. 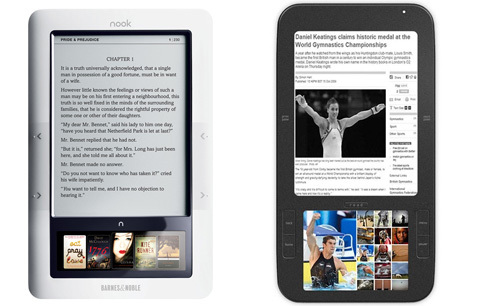 I personally like the look of the nook better. The other one looks way to stretched. If no one stole, technology would get no where. Terrible practices by Barns&Noble, first refusing to partner with Spring Design, then blatently stealing the product and trying to pass it off as their own. Assuming, the claims by Spring Design are truthful, it's a battle between the lawyers now. It'd be nice if patents only applied to real innovation. I can understand a patent for the first electric lamp, but the guy that got the follow-up patent for the first electric lamp with two bulbs just annoys me. Then again, I also think the idiots running around patenting things that other people are already doing, like the “human shaped avatar based social space” patent guys who are suing every internet gaming company they can, should be tarred and feathered.